DODGE CITY, Kan. — DCHS girls coach Kelley Snodgrass needed no words to give her team motivation going into Tuesday’s game with the Tigers. Dodge City had nothing to lose, they had already lost twice to Ulysses this season, once at Ulysses and once in the Mid America Classic in McPherson. The pressure wasn’t on the Lady Demons, it was all on Ulysses, because it’s so tough to beat a team three times in one year. Dodge City would use the third time’s a charm to their advantage, winning 41-40 in overtime. The opening minutes of Tuesday’s game looked like it could be another win for the Tigers, as they would jump out to a quick 11-1 lead after the first quarter. The only point for Dodge City came from junior Chidera Okoro’s free-throw. Dodge City committed eight first quarter turnovers, leading to all 11 points for the Tigers. 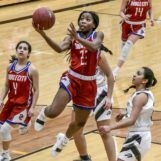 Freshman Kya Edwards stepped up big in the second quarter for the Lady Demons, as she would score seven points in that quarter to help give a little spark to Dodge City. The Lady Demons went into the halftime break trailing, 20-14. Kisa Unruh, Dodge City’s leading scorer was held scoreless for the entire half. It didn’t take long for Unruh to get a spark going in the second half, as she would hit back-to-back three’s to tie the game at 20 apiece early in the third quarter. The Red Demons carried the momentum from those buckets to build a six-point lead going in to the final quarter, 29-23. The fourth quarter would go back and forth, as neither team could build a comfortable lead. Dodge City had a chance to win it in regulation, but a missed jumper would result in a jump ball and gave the possession to Ulysses with 2.9 seconds to go. Okoro was ready for her time to shine, as the junior got a long rebound and then took it all the way down the court for two, to put the Lady Demons up 34-32 not even 10 seconds into the overtime period. Ulysses would take a three-point lead at 40-37 with 26 seconds to go. Dodge City would miss a three-point attempt, but the rebound and runner through the lane was good for sophomore Lauren Gleason to pull the Demons within one, 40-39 with 9.9 seconds to go. After a Ulysses timeout, Tiger senior Madison Haney would throw the inbounds pass… Her pass would be a bounce pass right in to the hands of Okoro, who would drive down the right side of the baseline and lay it in for two, bringing the crowd to their feet, as Dodge City grabbed the 41-40 lead. Ulysses had a chance to win it in overtime when Alyssa Castilleja drove the length of the court, but her runner from the middle of the lane would rim out and the Lady Demons mobbed Okoro at half court. Ulysses: Castilleja 13, Haney 12, Oglevie 4, Garcia 3, Gomez 4, Ballesteros 4. Dodge City: Johnson 10, Unruh 11, Gleason 2, Okoro 9, Edwards 7, Solis 2. What’s Next? The Lady Demons (7-8, 1-2 WAC) will be on the road at Liberal on Thursday evening. Tip-off is scheduled for 6 p.m. at the Big House. Pregame coverage begins at 5:45 p.m. on Z98.